Borough of Churches is a six part miniseries by writer Adam Cheal (Toxic Storm, Terminus at Fenton’s Green, British Showcase Anthology) and artist Amrit Birdi (Username: Evie). Throughout history, the chosen few have joined the ranks of the “Borough of Churches”. A Secret order tasked with an ongoing battle to destroy the forces of evil. Charlie Swanson is the latest recruit. Trouble is, she didn’t ask to join and doesn’t give a damn about the B.O.C or what it fights for… Yet! Charlie “Chuckles” Swanson was a normal everyday NYC police officer, doing her bit to make the world a better and safer place. That was until a random encounter awakened a dormant gene causing a transformation into a human vampire hybrid. 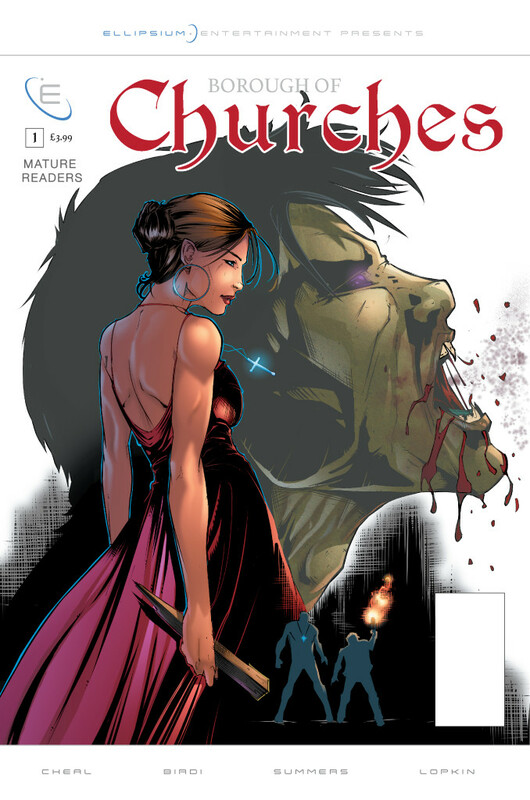 Discover the secret order of the “Borough of Churches”, directly from Charlie who will tell you her story the only way that she can… with humour, horror and a whole lot of blood! Welcome reader to the first instalment of the series that will have you hooked from the get go. In this setup origin issue, you are introduced to our lead character, Charlie Swanson. She is as quick witted as she is beautiful, just don’t get on her bad side… OK!